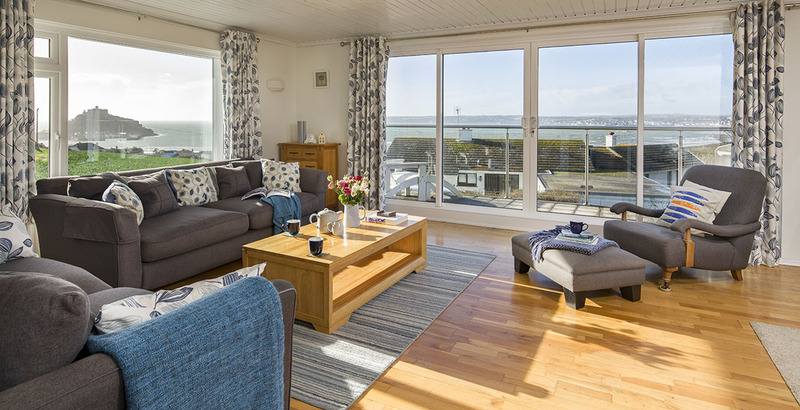 This stunning holiday home boasts unparalleled views over Mount’s Bay and across to the iconic St Michael’s Mount, as well as providing a spacious and stylish interior, perfect for a large group or a couple of families to stay. 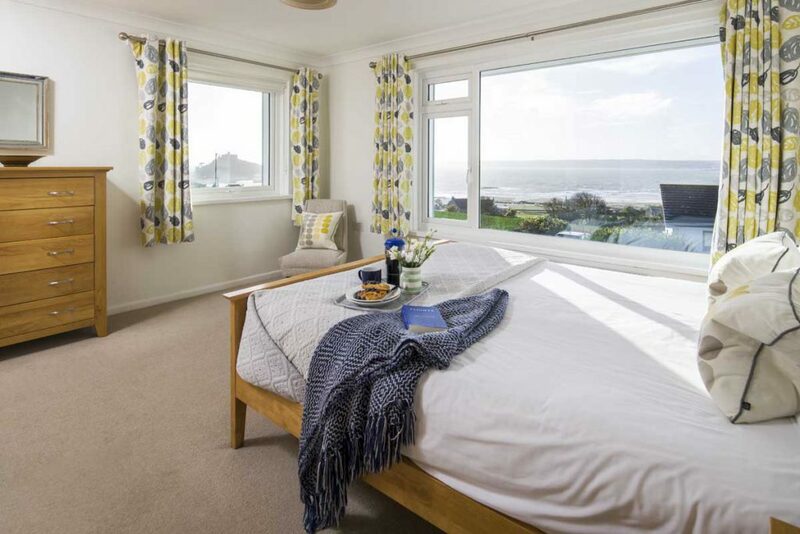 The View is also in an excellent location; minutes away from the picturesque old town of Marazion, with it’s tiny shops and galleries, and a number of beautiful gardens nearby, just waiting to be explored. Before you even step into ‘The View’ you are met with sensational views across the bay; giving you a taste of what to expect once you’re inside this fabulous home. As you walk over the threshold you will be instantly greeted with a large, bright and airy interior in the form of the entrance hall, which leads off to various rooms. Three of the six spacious bedrooms are up here on the first floor (one ensuite), as well as the family bathroom and the fabulous open-plan kitchen, diner and living area. The lower floor consists of an additional living area; the perfect space for young teenagers or children to entertain themselves away from it all, or even for a second family to utilise. A further three bedrooms can be found on this level (another ensuite), as well as another bathroom; a book case and chest on the landing provide plenty of games and books too. Ample off-road parking for up to three cars is located at the back of the house, out of the way where they won’t disrupt your views. A large well-kept garden stretches round to the side and the front of the house; the perfect escape from a hard day’s work of exploring the local area. The popular ancient town of Marazion lies just moments away; wander down the hill straight onto the coastal road where you can either turn left for the little shops, cafes and galleries, or turn right to enjoy a lovely long, flat walk across the large beach that spans the width of Mount’s Bay. Or, go straight ahead and (at low tide) walk across the causeway to the castle-topped island of St Michael’s Mount (National Trust), where you will find fairy-tale turrets, dazzling views and sub-tropical gardens, and a church dating back to medieval times. For food and drink, head to Ben’s Cornish Kitchen where you will find local produce simply cooked in comfortable surroundings, and The King’s Arms pub is in the heart of the town, serving up the best in local ales with a small beer garden; ideal for people watching! 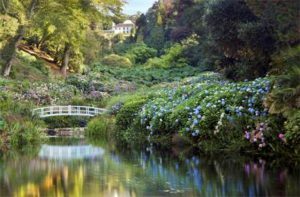 Tremenheere Sculpure Gardens is situated just a couple of miles away from Marazion, where modern art installations line exotic plant-filled gardens, offering panoramic views of the bay. 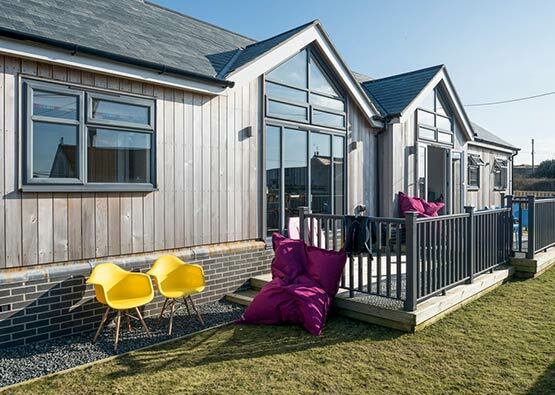 Whilst The View provides all of the comforts you could ask for in a holiday home, there is plenty to see and door when/if you step out the door. The fact that The View has two comfortable, well-equipped living areas is most certainly a desirable element of a house this size. 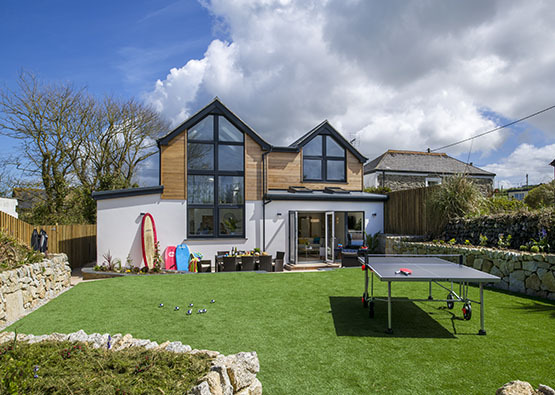 The downstairs living area opens up to the large, lush garden through sliding doors, allowing children or young adults to use this area, whilst the adults enjoy breathtaking views from the kitchen-diner-living space upstairs. 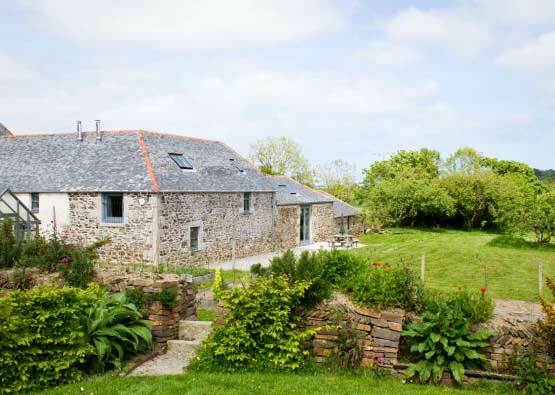 The house provides the perfect retreat within a retreat; if you are looking for a place that is suitable for a large family, or a couple of families then The View is the right choice. This beautiful expanse of coast sweeps in a gigantic horseshoe shape from Porthleven to Mousehole on Cornwall’s south coast. 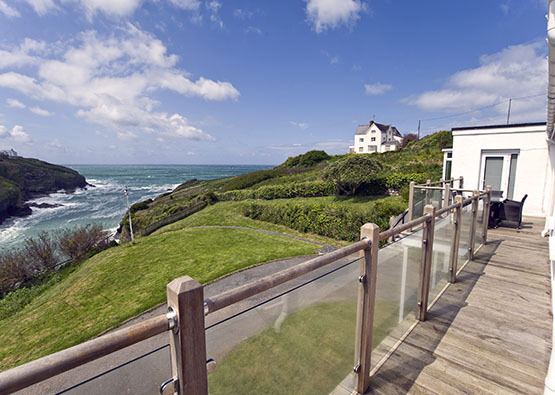 It’s our largest bay and boasts panoramic ocean views from dramatic cliff tops, pristine sandy beaches and unspoilt fishing villages – plus of course many miles of the south west coast path waiting to be explored right on your doorstep. There is simply no better place to be. Like a pearl in an oyster shell, the iconic St Michael’s Mount commands the bay. It’s been inhabited since neolithic times and is now managed by The National Trust. The mount attracts thousands of visitors each year, most of whom reach it by foot at low tide by walking across the medieval causeway from Marazion. You’ll find a beautiful little harbour to explore with narrow winding cobbled streets and little boutique shops, as well as the castle and gardens. The bay itself starts in the east with Porthleven, a working fishing harbour which has excellent eateries including Rick Stein’s, and popular fine dining establishments such as Kota Kai (our favourite), Amelie’s and The Square. Local businesses, charities and bands line the streets for the annual Porthleven Food and Music Festival in April, which is a great celebration of local produce and music. The dramatic cliffs west of Porthleven make memorable walking, and take in the beautiful stretch past Rinsey with iconic Wheal Prosper mine engine house – as used in the filming of Poldark. Here you may spot seals or even dolphins and basking sharks. Further along you’ll find the mile-long stretch of Praa Sands, with its famously pure and white sand. This is a lifeguarded beach, and one of the best in the region. Heading west, next up is Prussia Cove, famous for its smuggling connections – and then the village of Perranuthnoe, which has a fabulous award winning gastro-pub, and other great little cafés. Most people discover Marazion as the parking place for visiting the mount – but it’s a beautiful village with lots to explore in its own right, including some notable restaurants. 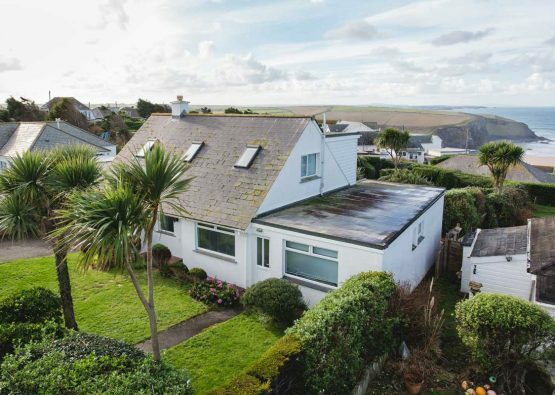 Between Marazion and Penzance you’ll find a crescent of superb sand, gently sloping into the sea for family-friendly access, but also a mecca for windsurfers. Penzance itself, the main town in the area, is host to much of interest, including art deco Jubilee Pool, stunning Morrab Gardens, a mile-long promenade, the intriguing museum and art gallery at Penlee House, and a host of independent shops, art galleries, antique shops and hostelries including the famous Admiral Benbow, which features in the beginning of ‘Treasure Island’. If you enjoy a cultural festival, check out Golowan in Penzance every June, or Newlyn’s Fish Festival in August. Penzance is also home port for the Scillonian III. The ferry sails to the Isles of Scilly daily. It’s really worth a day trip to see these beautiful islands for yourself in just a few hours (or you can fly from Newquay or Land’s End). Nearby are the National Trust gardens of Trengwainton with delightful tea room and amazing ‘Noah’s Ark’ vegetable patches, said to be made to the exact length of the ark. Or Tremenheere Sculpture Gardens. Or visit nearby Polgoon vineyard…. we could go on. At the far western end of the bay you will find the fishing village of Newlyn. This really is a Cornish harbour the way it should be, with working boats bringing in the catch – one of the best places to buy fresh fish (or let someone else cook it at legendary Lewis’s fish and chip shop). Or simply wander the town’s narrow streets. Beyond is the undeniably quaint harbour of Mousehole, which offers boutique shops, beautiful views from all aspects and famous harbour illuminations at Christmas time. Whichever bit of Mount’s Bay you find yourself exploring you will definitely find astonishing views, plenty of culture and history, unique festivals and friendly people – what more could you ask for?! Newquay Airport is 42 miles from Marazion. You can fly to Newquay from London Gatwick, Manchester and the Isles of Scilly all year round with summer flights to and from London Stansted, Edinburgh, Aberdeen, Birmingham International, Doncaster Sheffield, Newcastle, Belfast City, Dublin and Düsseldorf. Airlines include Flybe, Aer Lingus, Skybus and Eurowings. Marazion is 3 miles from the A30, with a driving time from London approximately 6 hours with good traffic, and Exeter is roughly 2 hours away. Full details to plan your route will be available on booking. Marazion is about 5 miles from the nearest mainline station at Penzance. Regular and convenient services run from all over the UK.